In 2014, Chicago acquired David Rundblad. In 2015, the Blackhawks traded picks and prospects for Antoine Vermette, Kimmo Timonen and Andrew Desjardins. Last season, they reunited with Andrew Ladd. However, they paid a great price in giving away a first-round draft pick as well as prospect Marko Dano. Last season, the Blackhawks received Tomas Fleischmann and Dale Weise at the deadline in a trade with Montreal, in addition to getting Ladd from Winnipeg. Weise played a total of 15 regular-season games. He tallied one assist then and later took part in four playoff games, scoring one goal. Fleischmann was in the lineup for 19 regular-season games. He scored four goals and added one assist. Fleischmann played only four playoff games, with no points. Bowman made it known that if this team is going to make the playoffs this season, he wants it to be the same group that’s been around since the beginning of the year. He doesn’t want players to fight for ice time and have no chemistry. 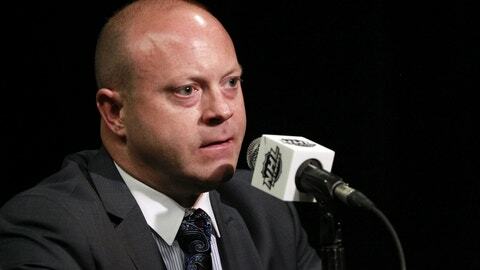 “We have a different dynamic this year because we have a lot more young players that have been with our team this year from the beginning,” Bowman said, also stating that veteran players aren’t likely to improve if they’re traded. They maintain a certain level of play. If anything, they are likely to drop off a little bit as the season goes on. Because the standings are so tight, Bowman also remarked that there may be fewer players on the market than usual. The Coyotes and the Avalanche are the only teams that have no hope to make the playoffs. Every other team is still in the realm of possibility. Bowman did acknowledge the lack of a left wing for top-line center Jonathan Toews, but Nick Schmaltz is now in that spot with his success since returning from his Rockford stint. With the amount of forwards the ’Hawks have, the puzzle pieces may fit together and work out. Trying to trade for a big piece may require giving up one of the young players on the current ’Hawks roster, and Bowman doesn’t seem too keen on risking that. It also seems that Chicago is focusing on amping up its prospect pool, and draft picks are always the way to go. But trading those picks away won’t help to build up the system. As Bowman made his statements, it looks as if the team is building a youth movement — now and in the future. For what it’s worth, take Bowman’s statement about not making a trade with a grain of salt. You never know what’s going to happen in the hockey world.